Total War: Rome II is getting better – and not even ‘buy in the Steam Christmas Sale’ better. If the patch notes of the recent flurry of weekly updates are anything to go by, it’s already significantly closer to being the game players had hoped it would be. Tomorrow’s patch will bring new, free DLC to the game and Creative Assembly’s “next major step towards mod support”. Beyond that, the Total War series will enjoy a path of post-release betterment it never has before, which is great when you read our Total War: Rome 2 review. 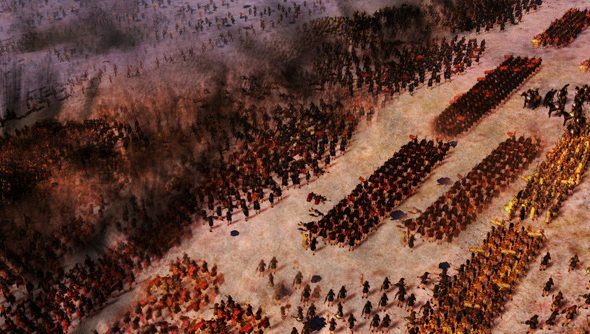 Creative director Mike Simpson says that comprehensive feedback from fans on Rome II’s official forum have enabled his studio to tackle post-release issues in a fraction of the time they have on previous projects. So much so that, in the next few weeks, Creative Assembly will be able to move away from pressing stability and configuration problems and onto improving the game’s feature set. AI fixes are among the toughest to test, as changes can take a 200+ turns to rise to the surfacce. As such, though patch 5 will go live tomorrow, CA have already begun work on patch 7. CA plan to be in a position where they’re happy with how the game plays “as fast as possible”. After that, they’ll shift gears into long-term support – an entirely new concept for the studio. Wahoo! There’s nothing that makes us feel alive like the staving off of obsolescence. What would you like to see appear in the next patch? Or indeed, patch 7? For more on why you should care, see the more upbeat parts of Fraser’s Total War: Rome II review.